Medical Legal Demonstrative Evidence: How Far Do You Want To Take Your Orthopedics Case? How Far Do You Want To Take Your Orthopedics Case? In this article I will discuss many of the various presentation options you have available to you in an orthopedics case ranging from the most simple to the most complex. I will provide the pro’s and con’s of each approach and try to provide some general ballpark figures for costs. I will also provide links to various examples so that you can better understand each option. Hopefully this will help you to decide which approach best meets your individual expectations when it is time for you to shop around for your demonstrative evidence solution. 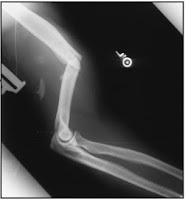 If you’re in luck, you may have good film evidence that clearly shows the fractures in you case. X-rays can be printed and enlarged at a variety of facilities and can often prove to be adequate and inexpensive demonstrative evidence. This works best with long bone fractures in which the fracture is clear and unmistakable. It is not as effective if the fracture is small or in a complex region such as a joint or in the skull since those fractures are more difficult to identify on films. The upsides to simple enlargements include the price that will usually be around $200 and the ease of admissibility. The downsides include lack of drama with static black and white films and the intimidation factor that some laymen may feel when asked to review even the simplest radiological study. A step above simple film prints is a radiological colorization. This is a process in which your illustrator will create a digital copy of your X-ray, CT or MRI and add simple flat color to the various structures and possibly more detail in the area of the actual injury. While this type of exhibit does not have the detail and clarity of a fully rendered medical illustration, it makes the film more accessible, understandable and dramatic while keeping costs down and retaining the authority of the actual film evidence. Simple colorizations can be acquired in the $300 to $600 range. Next, in the level of complexity is what I refer to as a radiological film interpretation and is another product option based specifically on the film evidence. Unlike a colorization where simple flat color is added, interpretations provide a fully rendered illustration of the skeletal anatomy based on a precise tracing of the actual film evidence. This type of process gives the image more texture and three-dimensional appearance allowing even the smallest fragments and details to be shown. Since this type of image is more realistic in appearance, it will often be more dramatic as well. The costs for this type of presentation could range from $700 to $900. Of course anatomical models continue to be a popular option for demonstrative evidence and there is a certain appeal to carrying a physical model into court that one can touch and pass around. The downside is that models most commonly are only available to demonstrate normal anatomy. While it is possible to acquire a custom model showing the actual injury, this custom process is often quite expensive. An alternative is to start with a normal anatomy model or skeleton and have your expert draw on the site or sites of fracture with a marker. While this would certainly help you to identify the sites of the injuries, it does not offer the drama that a depiction of the actual injury would provide. Anatomical models range widely in price, but even a full skeleton can be bought for as little as $300. The most popular option for medical demonstrative evidence is still traditional medical illustrations. These are images created by a skilled illustrator based specifically on your case information. While these exhibits could certainly incorporate the film evidence, the illustrator is not tied to these films as the only source of information. Therefore, unique views are possible that may not be seen in any one film to best demonstrate the injuries in a clear and dramatic fashion. Surgeries may also be incorporated into medical illustrations. An experienced medical illustrator can interpret the narrative report from a written operative note and provide a step-by-step depiction of the key steps of this procedure. Another popular illustration format is to provide a “progression of condition” showing the same area of anatomy over time. This can allow you to compare normal anatomy, the post-accident injury, the post-operative condition and later complications. Flexibility is the primary attribute for this type of exhibits since almost any conceivable issue can be portrayed. Prices can range from $800 to over $2000 depending on your provider and the complexity of the information. The most dramatic type of presentation available is custom animation. Today’s technology allows for almost any structure to be modeled electronically in 3D so that your medical animator can show the anatomy, the injury or even the surgical procedure in a fully custom motion picture presentation. These animations present the information in an understandable and accessible way that appeals greatly to the younger generation that has come to expect such media. 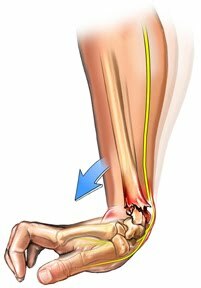 Animations are especially effective in cases that involve motion allowing you to show how injuries occur, how they affect bodily function or how they are repaired. The downsides are primarily the time and cost involved. Since the animation process is so much more involved, you should anticipate approximately 300 to 400% more time for production with a comparable increase in cost. The final option we should cover is interactive electronic presentations. The may range from simple PowerPoint presentations combining a few pictures and text pages to fully custom professionally designed programs incorporating animations, video, photographs, illustrations and all kinds of supporting documentation. These types of presentations are growing in popularity as more and more in the legal market become comfortable with the technology required. The primary benefit of electronic presentation is the organizational advantages when all your demonstrative evidence is combined and accessible through your laptop. No longer do you have to carry multiple charts and graphs into the courtroom and constantly put up and take down items from the easel as you move from topic to topic. Disadvantages include the technology and equipment required for display and the possible limitations of your presentation environment. In other words, you will need to have a solution for projecting or displaying the presentation and you will need to become comfortable with the technology required, and you will need to give consideration as to the facility where you will be presenting and determine if any equipment will be available to you and if the light levels will allow for the proper viewing on your projection screen or monitor. Prices vary widely depending on the amount and complexity of your information. Ben, excellent post as always!! !